The Miami based singer posted the news on social media, where she had been updating fans of her health recently. The family of legendary Miami singer Gloria Estefan is mourning the passing of her mother Tuesday night. 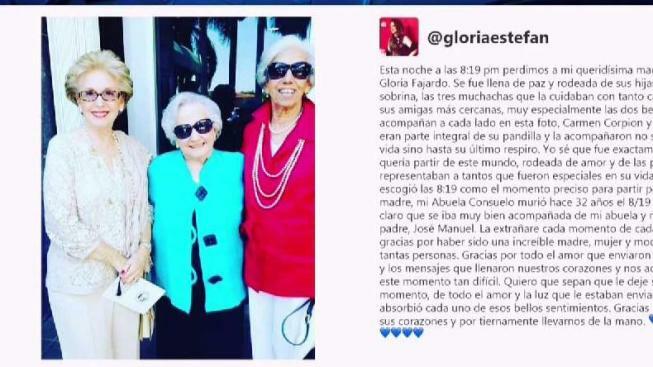 Estefan posted the news to her Instagram page, saying that Gloria Fajardo “went peacefully” while being surrounded by family and friends at the age of 88. The singer had been posting updates on social media regarding her mother's health in recent months. Farjado and her husband, Jose, fled their native Cuba shortly after that country’s revolution - arriving in Miami where she worked as a school teacher for the then-Dade County Schools system. Estefan wrote that the time of her mother’s death, 8:19 p.m., was significant because Fajardo’s own mother had died on August 19th over three decades before.